The new left or right COR-36-TRB direct vents have been completely updated to provide a beautiful look and burn. With standard metal refractory, a massive log set and glowing embers, you’ll get an elegant fire and plenty of energy-efficient heat. 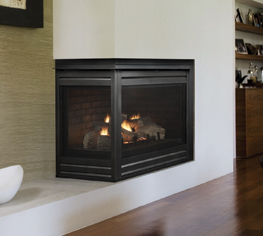 Brighten and warm up that dull, dark corner with this new corner gas fireplace from Heat & Glo.